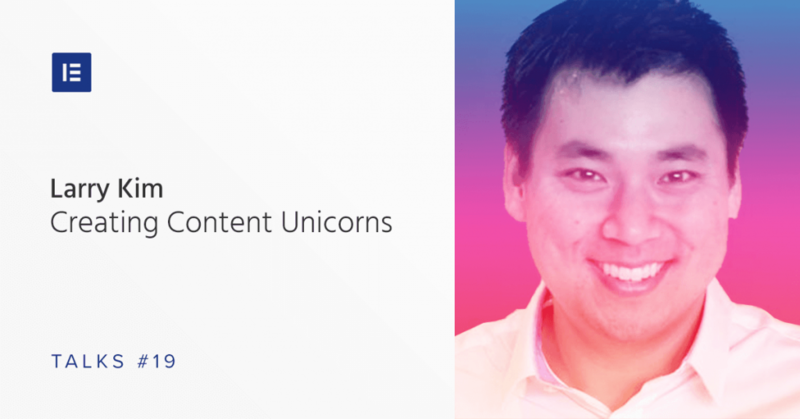 WordStream founder and MobileMonkey CEO, Larry Kim, is known by millions thanks to his popular posts on Medium, Inc, and Hubspot. In this podcast episode, he breaks down his Unicorn Marketing theory and explains why marketers can, and should, write about anything. Larry Kim is the founder of WordStream, one of the leading providers of AdWords, Facebook, and keyword tools, used by millions of marketers worldwide. He recently sold WordStream for 150$ million dollars and shortly after proceeded to his new challenge – CEO of MobileMonkey, a Facebook Messenger marketing platform for marketers at companies of all sizes. Larry is ranked the #8 most popular author on Medium, and also contributes to CNBC and Inc Magazine. He has been chosen to the Marketer of the Year awards from Search Engine Land, US Search Awards and PPC Hero. Larry claims that it’s time to realign our definition of quality with how Facebook and Google algorithms paid inorganic work. But what does it actually mean? Larry explains: “There are so many gurus and experts who talk about how to do marketing. It’s kind of a joke. They all just say, ‘You know, you should focus on creating quality content.’ I’m like, ‘This is so ridiculous.’ Of course. No one’s intentionally trying to create bad quality stuff, yet most of the efforts that we spend as marketers go nowhere. So, I just found that typical advice is being not very actionable because specifically defines quality. There are all sorts of different definitions of quality, like they say, ‘1,500 words’ or they say, ‘Five images,’ like a checklist of things that you have to check the box. Then, that makes your quality effort. My point is just to say that it has nothing to do with how much time or effort you put in this content that defines quality or not quality. The quality is defined by the outcomes, so was this like a spectacular blog post that generated 10 million views, or was it one of these crappy donkey blog posts that generated 50 views? Larry’s signature theory deals with Unicorns and Donkeys. What does it suggest? “The unicorns and donkeys, this is just a metaphor that I use to describe sort of your remarkable marketing campaigns versus everything else. So, the unicorns would be those … You know, Ben, when you look in your blog analytics, there’s 3% of your blog content generates 50, 60, 70% of the blog traffic, typically? So, those are your unicorns. Then, there are probably thousands of articles that went nowhere. Those are your donkeys. We see this in every marketing channel. A few pieces of content generate the most SEO traffic. We see a few keywords generate the most traffic. We see a few social media posts get enormous amounts of engagement and most of the social media posts, those are donkeys. They go nowhere. So, basically, what I’m just saying here, it’s just realigning the definitions of quality to along the lines of how algorithms work today. This is just a realization that 70, 80, 90% of your traffic is going to come from platforms such as Google as organic search or Facebook organic social reach or Facebook ads or Google ads. Every single one of those platforms is surfacing high click-through rate content, higher than the search results, higher in your newsfeed, lower ad costs, etcetera, based on higher click-through rates. It would be very difficult to have a unicorn piece of content that didn’t audition well in those different channels, if that makes sense. “Like there’s a content calendar. Typically, they’ll say, ‘Hurray! We’ve got a great blog post.’ Then, they’ll say, ‘Okay, what’s next on the calendar? Oh, it’s winter so let’s do something about snowing,’ or something. It doesn’t make any sense. What you should do is you should stop everything you’re doing like in marketing. Marketing is one of these fields where there are so many things that you could possibly be doing and not enough time and resources to do everything. So, you have to prioritize making unicorn babies over any other marketing tasks or operations that are happening at that time. So, what I mean by this is you have this great piece of content. It’s doing really well. That means it’s really rare and remarkable. It means that it’s going to do well in other channels. So, if it was a blog post, you should turn that into a webinar. Why? Because it’s the same reason why this topic did so well as a blog post will ensure its same success in a webinar format. With webinars, you can collect registration data, whereas just a blog post, you don’t have anyone’s information. You should turn this into a downloadable e-book. You should turn this into an ad campaign. You should turn this into contributed articles for different sites. You should be test-posting this content. “So, a lot of times, when you’re marketing, you’re working in a niche like I used to sell AdWords software. Now I’m selling Facebook Messenger chatbot software. There’s just not a lot of … It’s not like blogging about health or sports. It’s just a very niche topic. So, one of the problems here is that if you’re only blogging in your niche, it really limits the size and scope of the audience that you attract. You see what I’m saying? So, it’s really important from time to time, not 100% of the time but could you dedicate 20 or 30% of your content creation efforts to creating content that’s outside of that niche to cast a wider net so that you could get the attention of people who aren’t just the same old people who are, I don’t know, WordPress fanatics or something like this, you know? Can we cast a wider net? So, the question is can we be strategic about what other topics that we pick? You absolutely can. There’s so many different tools to do audience analytics. So, what you could do is you could create an audience of your customers and analyze that data through Google Analytics. You could kind of look at their demographics and interests and behaviors and try to figure out what are the other things other than Messenger marketing or WordPress, what are the other things that they’re interested that are bigger than just the niche? So, for me personally, there’s a lot of interest amongst my audience in topics like entrepreneurship and start-ups. So, I got this information from … You can do the same analysis in Twitter. You can analyze using Twitter analytics. You can analyze the interests and behaviors and demographics of your following. Then, you can do the same and also in Facebook Analytics. So, basically what you’re trying to do is create content on a subject that you can credibly speak to. I don’t know. They might have interest in yoga but I just can’t be authentic talking about yoga because I know nothing about it. So what you’re trying to do is find a kind of an adjacent topic based on analytics data that is both significantly larger than the niche that you’re in but also something that you can credibly speak to, okay? You still need to be authentic here. For me, that was entrepreneurship start-ups. It’s such a great topic because I know that the people who will consume this content may also have a good chance of later buying AdWords software or Facebook ads software or Messenger software because my audience analytics has kind of indicated to me that that is a very discriminating trait amongst my best customers. “There are more daily active users on popular messaging platforms like messenger and WhatsApp than on social media, okay? More daily active users on messaging than social media, yet less than 1% of businesses are using messaging technologies to compete with their customers. So, my thinking here is just that’s crazy. Consumers overwhelmingly prefer messaging over email but yet most businesses are just doing email and only email, not messaging. So, I think this is an interesting space. I think that maybe in the next three, four, five years, we could see 30% or even 40% of businesses adopting this kind of technology, so it’s kind of along the lines of what I was saying earlier. I like to try to identify future marketing platforms and participate in those ecosystems. As I look at the merging marketing channels, I can’t see anything bigger than messaging that isn’t already big. Look, it’s a complete reimagination of the marketing stack. So, if you think about it like how marketing works right now, it’s all built on email as the substrate upon which all this infrastructure is built, so I look at something like HubSpot. Landing pages, those are used to collect emails, basically, you know? Woocommerce product attributes are not available in elementor pro widgets. When are they coming ? They are available inside the Additional Information widget. Good interview with Larry, he’s always ahead of this times and he just thinks logically and puts it out there which I find refreshing. I love this guy!!! I’ve got to be better at using my unicorns across all my channels! Thanks for the great article and interview!